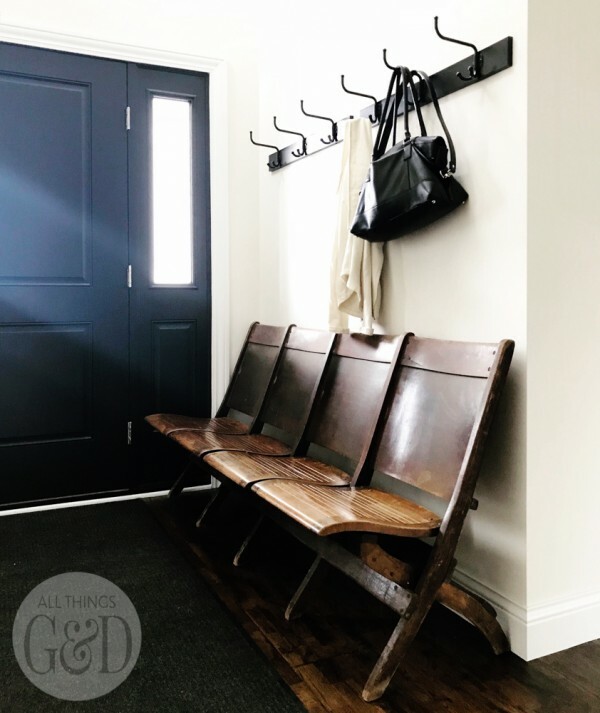 I’m completely obsessed with our new entryway antique church bench! 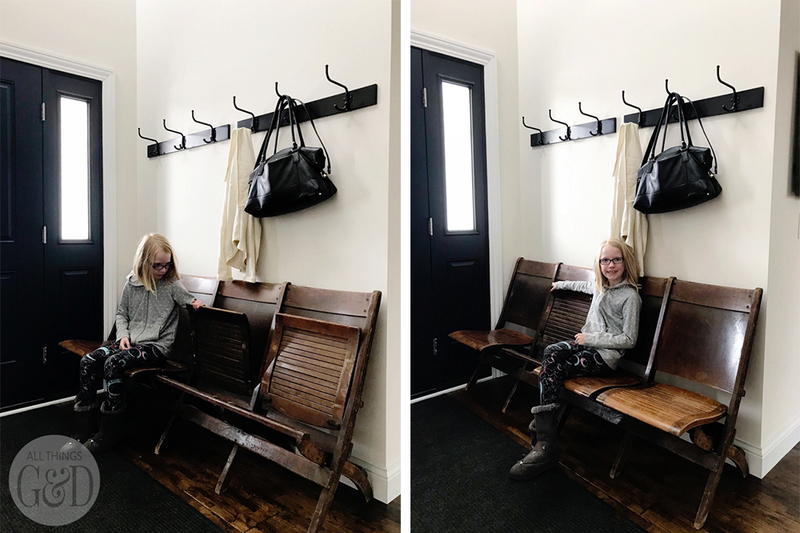 G wanted seating in our entryway for getting shoes off and on, and I wanted more antique items in our home, so I asked him to keep an eye on Craigslist for an antique church pew or theater seats. Imagine my shock when he found the perfect combination of both the very next day! 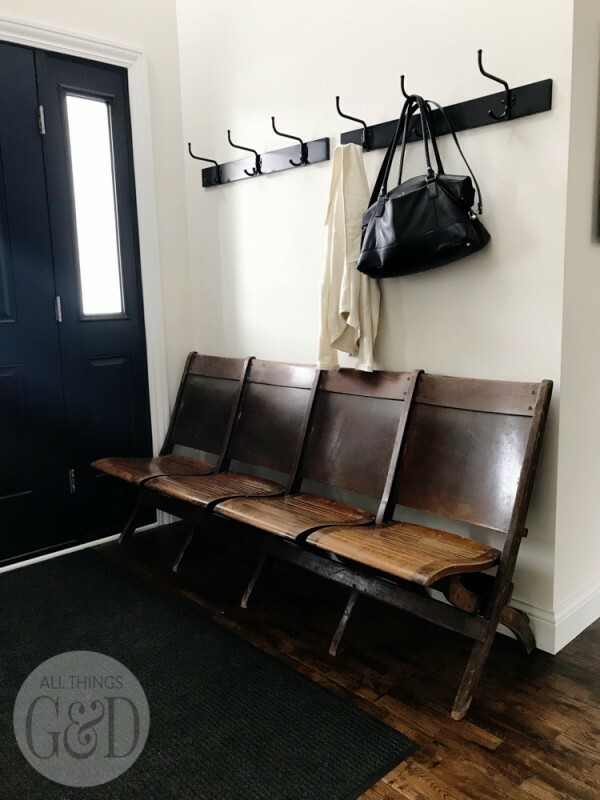 This gorgeous old piece is a connected row of four seats rescued from an old church in Wisconsin before it was bulldozed. They’re 100 years old and in incredible condition! They’re connected across the back, but each seat bottom lifts up individually, which is so neat. Each seat folds up individually – so neat! Even the finish on them is perfection. 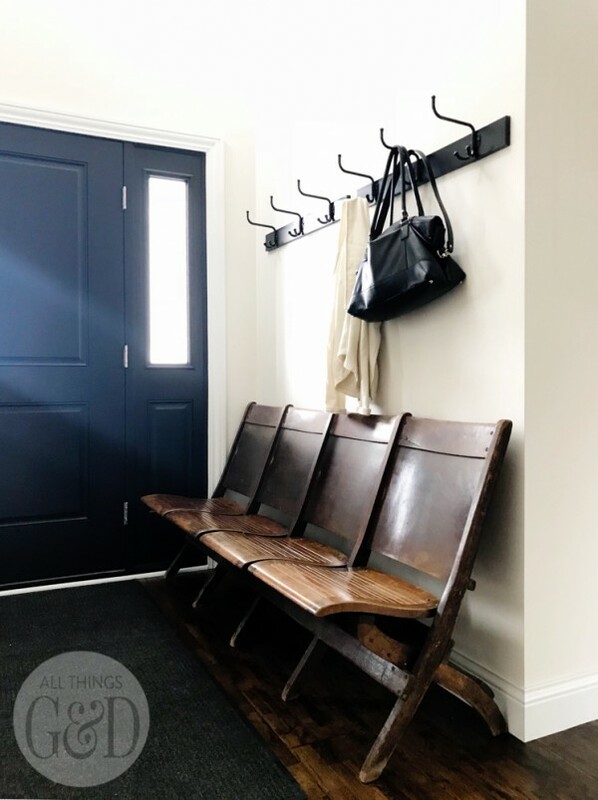 They match our entryway space beautifully, and I love the natural signs of wear they have on them from over the years. I’m so glad these gorgeous seats were saved, and that they’re now ours! Also new in this space are those hooks. G and I found them at IKEA when we were in Chicago for spring break. They’re all metal and so neat! They’re the IKEA PINNIG rack with 3 hooks in black. We hung two of them side by side to sort of mimic the look of one long rail of hooks. 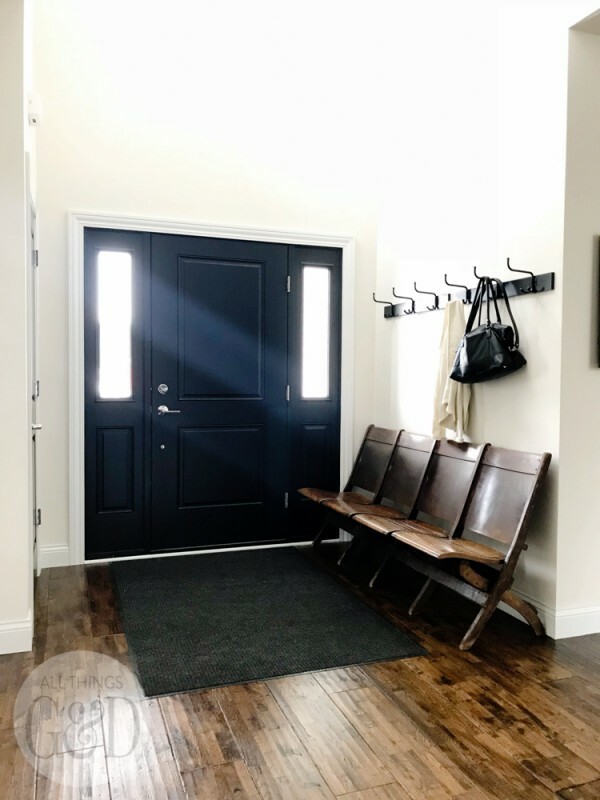 Now we just need some art for over the hooks and a nicer rug for when it’s Not Winter and our entryway decor will be complete! Looks great! I love the perfect antique find. P.S. — I hope this doesn’t sound super awkward, but I’m dying to see the bathrooms in your house. lol! Thanks, girl! I do love my bathrooms. I’ll post some pics at some point. Right now my powder room is giving me fits with how diva it wants to be all over this stencil situation. Agh! I’m curious – how much did those cost? I’m always impressed by those who have an eye for interior design. I feel like I have a decent eye, but I always shy away from things with a higher price tag, which keeps my house looking pretty boring. Hi Stephanie! This piece was a total steal – only $120. I seriously couldn’t believe it! Keep an eye on Craigslist and Facebook Marketplace and you’ll eventually find some total steals. Some people don’t realize the treasures they have. Wow, that piece is to die for!! Absolutely beautiful, thanks for sharing. Thank you so much! I’m so thrilled G found it. Such a treasure. Thank you so much! 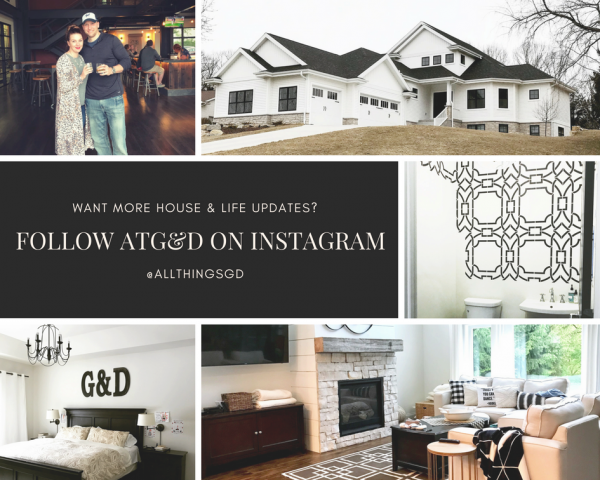 We’ve been working on doing a mix of new, old, shiny, and rustic. It’s been fun!